Dudjom Gompa aka Urgyen Dongak Chöling was founded by Dudjom Rinpoche in Bodhnath, Nepal, next to the Bodhnath stupa. Dudjom Gompa is off the main street of Boudnath and has a discrete frontage. Inside, however, it is said to be the most inspiring place, with many statues, and a feeling of it being a place of continual dedicated practice over a long period of time. This is the place where Dudjom Rinpoche gave his last major teachings. After he passed away in Dordogne, France, his body was embalmed and brought back to Nepal. Following this, his body was taken to Dudjom Gompa, where it was placed in a stupa built within the main temple. The construction was supervised by Chatral Rinpoche. 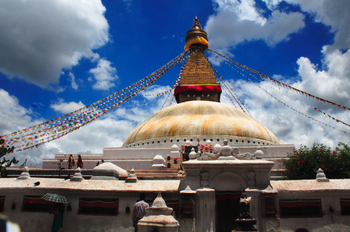 The reliquary stupa is still visible today, and one can circumambulate it during the day. 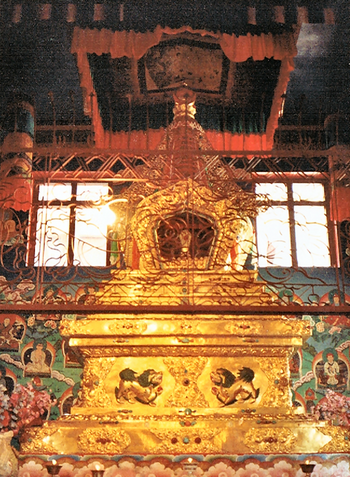 Dudjom Gompa is therefore a very sacred place for many Dharma practitioners, and especially for those connected to the Dudjom Tersar lineage. This page was last edited on 1 June 2014, at 07:07.